Treat yourself to this and so much more on our 5-night safari package. 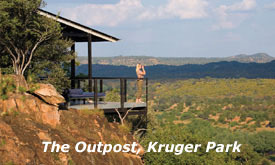 Package price include 2 nights at Kings Camp, 2 nights at The Outpost and the 5th night at your choice of Kings Camp or The Outpost, Air transfers from OR Tambo International to Kings Camp, Air transfers from Kings Camp to Punda Maria, Return Road transfer from Punda Maria to The Outpost through the park, Air transfers from Punda Maria to Phalaborwa Airport, Three meals daily and all beverages excluding premium brands and cellar wines. 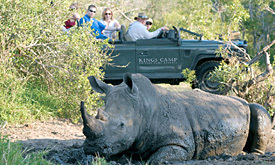 Two game drives per day and optional walking safaris. in open, state-of-the-art game viewing vehicles.